The Runasimi Outreach Committee (ROC), the Native American and Indigenous Students’ Group (NAISG) and the Movimiento Indígena organized Quechua Night and Celebration of Native Cultures. During the semester ROC hosted Quechua Conversation Nights and Quechua literature workshops with visiting scholar Gladys Camacho Rios. 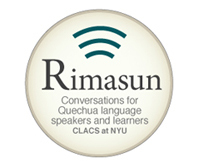 They also publish a podcast series with interviews and conversation ins Quechua and Kichwa languages. The event brought together indigenous student and community groups for a night of Native dance and music performances. The atrium of the King Juan Carlos Center became the performance space for Silvercloud an inter-tribal Native American singing and dance group opened the event, Kalpulli Atlachinoll, an Aztec dance group and Steve Cotaquispe and Luis Aguilar performing the Danza de las Tijeras. Silvercloud opened the event with a drumming ceremony. Next, Kalpulli Atlachinoll officiated a blessing of the four corners. Steve Cotaquispe and Luis Aguilar performed a shortened version of the Danza de las tijeras, which can last for hours. The dance in performed in teams, with each dancer challenging the other. Steve Cotaquispe and Luis Aguilar. 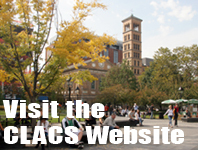 This past November, Master’s students participated in a CLACS photo contest with images from Latin America and the Caribbean. Here we present a picture from each participant. CLACS students are not only brilliant academics, but also remarkable observers and photographers! Charlie Uruchima took the above picture in Otavalo, in the summer of 2012. Otavalo is located in the northern Andean region of Ecuador. “I went up to Ecuador that summer to practice my Kichwa after having taken an intensive summer Quechua course in Cusco, Peru. The photo was captured along my way to the town’s main plaza,” said Charlie. The young woman shown in the picture is a shoe shiner belonging to the Asociación de Betuneros de Otavalo (The Shoe Shiners Association of Otavalo). 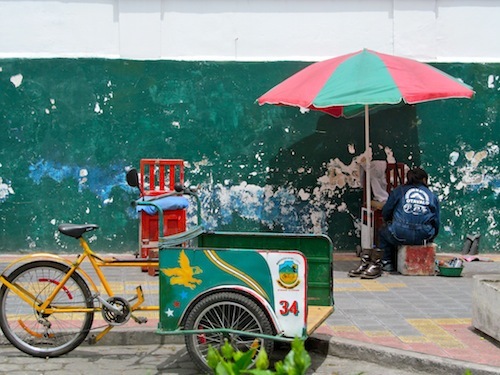 The cart on the foreground is used to transport her shoe shining equipment (shoe shining kit, chair, umbrella, etc.). The picture captures the viewer for its nice composition and intense colors. The peeling green wall resembles an abstract painting. The following picture displays a young girl leaning on a brick wall. In the out of focus background there is another standing figure.